The site discusses the principles of airborne radio navigation, whereby the pilot can determine the aircraft's position by triangulation using two ADF or VOR stations, or by polar coordination using VOR bearing and DME distance information. Upon request, the pilot can relay the aircraft's position and altitude to the Air Traffic Control (ATC) center by means of the VHF communication system. Although this method is effective, it is not an optimum solution in high-traffic areas where the controller must be constantly informed of the exact position of all aircraft at all times within the controlled airspace(Though there is no such higher density of traffic in our region). For this reason, the ATC center uses a ground-based radar surveillance system to automatically monitor the location of all aircraft within the control area without cluttering up the radio communication channels. With this information constantly displayed on the ATC radar scope, the controller is able to make timely decisions regarding handing over aircraft to the approach or departure control center, vectoring aircraft to avoid collision courses, maintaining safe altitude separation between aircraft, and locating and directing aircraft that are lost. The ground-based ATC radar system consists of a primary surveillance radar (PSR) and secondary surveillance radar (SSR). The PSR locates and tracks aircraft within the control area by transmitting a beam of energy which is reflected from the aircraft and returned to the PSR antenna. The SSR transmits interrogation signals to the airborne radio beacon Transponder. Upon receiving the interrogation, the Transponder sends a coded reply signal back to the SSR system. Data received from the PSR and SSR are used in conjunction to develop the total air traffic situation display on the controller's radar scope. This enables the controller to identify Transponder-equipped aircraft in addition to determining the range and direction of all aircraft within the control area. There are two types of radar systems installed each ATC ground station. The first, called the Primary Surveillance Radar, operates on the principle of sending a narrow beam of energy, which is reflected from the aircraft under surveillance, and measuring its distance by noting the time lapse between the radar pulse transmission and its received echo. The second, called the Secondary Surveillance Radar, operates on the coded reply sent from the airborne radio beacon Transponder in response to an interrogation sent from the ground station. The Radar station at Piduruthalagala(Sri Lanka), the PSR and SSR antennas are co-located and scan synchronized, and both radars are used in conjunction to develop the total air traffic situation display on a single CRT radar scope, called the Plan Position Indicator (PPI). The Radar station at Katunayaka(Sri Lanka) is a PSR type and rotate at a speed of 15 revolution per minute while Radar at Piduruthalagala at a speed of 12 rev. per minutes. The reason for this difference in revolution speed is that, as aircrafts approaches close to the airport the sky gets congested and needs constant updates of the positions of the air movements. The PSR sends out radio waves in a very narrow beam. The ground antenna is made to rotate so that the position of the narrow beam of energy can be directed. When the directed beam strikes an object or target, some of it is reflected back to the radar antenna. This reflected signal is detected and processed to provide a display (indicated by a bright "blip') on the ATC PPI, which shows the location of the target (i.e., aircraft). The PSR system works well in low traffic areas; however, as the air traffic increases in a given area, the PPI display becomes cluttered-and specific targets may become difficult to distinguish from one another. Also, since the energy of a radiated RF signal is attenuated as the square of the distance it travels, the resulting weaker radar returns are accompanied by noise which tends to obscure the displayed target. Targets may also be lost due to ground clutter from terrain and precipitation unless a Moving Target Indicator (MTI) circuit is employed to detect and display only moving objects. Finally, the PSR has the distinct disadvantage In that the operator has no way of knowing the altitude of the aircraft unless the pilot reports It. All of the problems associated with the PSR system have been addressed with the introduction of Air Traffic Control Radio Beacon System (ATCRBS). The ATCRBS incorporates the use of the Secondary Surveillance Radar in conjunction with the airborne radio beacon Transponder. The SSR was developed from the military Identification-Friend-or-Foe (IFF) system, in which an airborne radio beacon Transponder responds to ground radar interrogations on one frequency by transmitting, coded replies on another frequency. The coded replies, displayed as short lines on the PPI, allow the controllers to identify the various targets by having each one send back a different coded reply. The desired code can be manually selected by the pilot on the Transponder control head in Mode W operation, or automatically set by an encoding altimeter or altitude digitizer for reporting the Aircraft's altitude in Mode "C" operation. Since the reply signal from the airborne Transponder is stronger than the reflected PSR signal, it will reinforce the "pip" on the PPI to provide positive aircraft identification. At the ATC radar ground station, received radar video and antenna azimuth Information signals are relayed from the radar site to the air traffic control center, where the signals are processed and displayed on plan position indicators. Since radar coverage of each site includes a large area in high traffic density areas, several controllers are assigned to various segments of the area covered. Each controller's segment of the area is displayed on his respective PPI. (You cannot observe such situation in Sri Lanka due to limited number of air movements prevail in compared to other countries). The PPI presents the operator with a map like view of the space surrounding the area covered by the ATC radar antenna. Four dots appear on the PPI; one at the center, and one of each of the three 1 0-mile points out to the edge of the radar scope. These dots rotate, in synchronize with the rotation of the radar antenna, to display concentric circles that indicate range. The incoming radar video signals are applied to a decoder control before being displayed. By adjusting the decoder to pass only a selected code, Transponders operating on the controller's code will appear as a short arc (blip) on the PPI, and as a bright arc when transmitting a special position identification pulse. Replies from Transponders not transmitting the selected code will be filtered out. "Skin-paint" echoes detected by the primary surveillance radar will be displayed for all aircraft. An illustration of a typical PPI display format is shown in the figure below. As previously mentioned, the ATC radio beacon system incorporates the use of the ground based SSR and the airborne radio beacon Transponder to determine the range and direction of aircraft responding to SSR interrogations. The following section will discuss the operation of the airborne Transponder in regard to receiving these interrogation signals and generating a coded reply signal to be transmitted back to the SSR ground station. An airborne Transponder transmits a reply signal on a frequency of 1,090 MHz in response to the SSR interrogation which is transmitted on a frequency of 1,030 MHz. Currently, there are two types of SSR interrogations, Mode "K and Mode "C", that may be transmitted by the ATCRBS ground station. The signal characteristics of the Mode A and Mode C interrogations are shown in the figure. Mode A interrogations are sent to request the specified aircraft identification code. Mode C Is used to request altitude reporting with identification. Mode B is occasionally used in place of Mode A in some countries and Mode D in presently not in use. Each interrogation mode is distinct from the other and is characterized by the spacing between the P3 pulse and the P1 pulse. Regardless of the interrogation mode, all three pulses are 0.8 microsecond wide. The purpose of the P2 pulse is to allow the Transponder to determine whether the interrogation was received from the main beam or a side lobe of the SSR radiation pattern, as shown in the following figure. A reply to a side-lobe interrogation would give the controller an erroneous indication of the aircraft's Position. For this reason, Side-Lobe Suppression (SLS) is used to inhibit the Transponder's reply in response to a side-lobe interrogation. The three-pulse SLS interrogation method uses a directional radar antenna that transmits a pair of pulses referred to as PI and P3 pulses. As previously mentioned, the time spacing between these pulses determines the mode of operation. Two microseconds after the P1 pulse is transmitted from the directorial antenna, the second pulse, P2, is transmitted from an omnidirectional antenna. The P2 pulse is used as a reference pulse for SLS determination. The signal strength of the omni-directional P2 pulse is just sufficient to provide coverage over the area that side-lobe propagation presents a problem. Side-lobe interrogation is detected by the airborne Transponder SLS circuitry by comparing the amplitude of the P2 pulse in relation to the PI pulse. When the omnidirectional P2 pulse is equal to or greater than the directional P1 pulse, no reply will be generated. Identification of the side-lobe interrogation is established before the P3 pulse is received. Therefore, the Transponder will be inhibited for a period lasting 35 microseconds, regardless of the interrogation mode. A valid main-lobe interrogation is recognized when the PI pulse is at least 9dB larger than the P2 pulse, as shown in the following figure. Reply signals are generated by the Transponder when an interrogation signal is determined to be valid. The coded reply signal is composed of a series of pulses transmitted on a carrier of 1,090 plus or minus 3 MHz. In Mode A operation, the number of pulses generated in a reply signal is determined by setting the four octal (0 to 7) digit code switches on the Transponder control head to the assigned identification code. Certain switch positions are reserved for special applications to cause the activation of an aural alert signal at the controller's console: Code 7700 indicates an emergency condition, code 7600 is for reporting a communication radio failure, and code 7500 indicates that a hijack is in process. The code selector switches provide the Transponder with the capability to send any one of a possible 4,096 identification codes. The Transponder replies to Mode C interrogations by generating pulses in the reply signal that corresponds with the aircraft's altitude. The received altitude information is then displayed directly on the controller's PPI. This information is not selected by the code switches on the control head, but is obtained directly from an encoding altimeter or altitude digitizer. These devices commonly use an optical encoder which is driven from an aneroid mechanism that is sensitive to variations in altitude. The encoder outputs a 1 0-bit parallel data code to the Transponder for the generation of Mode C replies. The coded reply signal consists of various arrangements of code pulses within the boundaries formed by the two framing pulses, F1 and F2. Regardless of the mode of operation, these framing pulses are always present in the coded reply signal and are spaced 20.3 microseconds apart. The reply code is divided into four pulse groups labeled A, B, C, and D. Each group contains three pulses that are assigned subscripts that indicate the binary weight of each. The first digit (1) consists of the Al pulse (=I), the second digit (3) consists of the 131 + B2 pulses (=3), the third digit (2) consists of the C2 pulse (=2), and the fourth digit (4) consists only of the D4 pulse (=4). The assigned reply code-0000 would cause no pulses to appear between the framing pulses, and code 7777 would result in all 12 pulses to be present between FI and F2. The Special Position Identification Pulse (SPIP), initiated upon request of the controller, is generated by momentarily depressing the IDENT button located on the Transponder control head. The SPIP causes a special effect on the controller's PPI that aids in determining the aircraft's position. This pulse occurs 4.35 microseconds after the last framing pulse (F2) and is transmitted with each Mode A reply for 15 to 20 seconds after releasing the IDENT button. where c = 3 x 108 m/s, the speed of light at which all electromagnetic waves propagate. The factor of two in the formula comes from the observation that the radar pulse must travel to the target and back before detection, or twice the range. A radar pulse train is a type of amplitude modulation of the radar frequency carrier wave, similar to how carrier waves are modulated in communication systems. In this case, the information signal is quite simple: a single pulse repeated at regular intervals. The common radar carrier modulation, known as the pulse train is shown below. The common parameters of radar as defined by referring to following figure. PW = pulse width. PW has units of time and is commonly expressed in ms. PW is the duration of the pulse. RT = rest time. RT is the interval between pulses. It is measured in ms. PRT = pulse repetition time. PRT has units of time and is commonly expressed in ms. PRT is the interval between the start of one pulse and the start of another. PRT is also equal to the sum, PRT = PW+RT. PRF = pulse repetition frequency. PRF has units of time-1 and is commonly expressed in Hz (1 Hz = 1/s) or as pulses per second (pps). PRF is the number of pulses transmitted per second and is equal to the inverse of PRT. RF = radio frequency. RF has units of time-1 or Hz and is commonly expressed in GHz or MHz. RF is the frequency of the carrier wave which is being modulated to form the pulse train. A practical radar system requires seven basic components. 1. Transmitter. The transmitter creates the radio wave to be sent and modulates it to form the pulse train. The transmitter must also amplify the signal to a high power level to provide adequate range. The source of the carrier wave could be a Klystron, Traveling Wave Tube (TWT) or Magnetron. Each has its own characteristics and limitations. 2. Receiver. The receiver is sensitive to the range of frequencies being transmitted and provides amplification of the returned signal. In order to provide the greatest range, the receiver must be very sensitive without introducing excessive noise. The ability to discern a received signal from background noise depends on the signal-to-noise ratio (S/N). where Pr is the power of the return signal. Since this is a significant quantity in determining radar system performance, it is given a unique designation, Smin, and is called the Minimum Signal for Detection. Since Smin, expressed in Watts, is usually a small number, it has proven useful to define the decibel equivalent, MDS, which stands for Minimum Discernible Signal. When using decibels, the quantity inside the brackets of the logarithm must be a number without units. I the definition of MDS, this number is the fraction Smin /1 mW. As a reminder, we use the special notation dBm for the units of MDS, where the "m" stands for 1 mW. This is shorthand for decibels referenced to 1 mW, which is sometimes written as dB//1mW. In the receiver, S/N sets a threshold for detection which determines what will be displayed and what will not. In theory, if S/N = 1, then only returns with power equal to or greater than the background noise will be displayed. However, the noise is a statistical process and varies randomly. The NEP is just the average value of the noise. There will be times when the noise exceeds the threshold that is set by the receiver. Since this will be displayed and appear to be a legitimate target, it is called a false alarm. If the SNR is set too high, then there will be few false alarms, but some actual targets may not be displayed known as a miss). If SNR is set too low, then there will be many false alarms, or a high false alarm rate (FAR). Some receivers monitor the background and constantly adjust the SNR to maintain a constant false alarm rate, and therefore all called CFAR receivers. 1.) Pulse Integration. The receiver takes an average return strength over many pulses. Random events like noise will not occur in every pulse and therefore, when averaged, will have a reduced effect as compared to actual targets that will be in every pulse. 2.) Sensitivity Time Control (STC). This feature reduces the impact of returns from sea state. It reduces the minimum SNR of the receiver for a short duration immediately after each pulse is transmitted. The effect of adjusting the STC is to reduce the clutter on the display in the region directly around the transmitter. The greater the value of STC, the greater the range from the transmitter in which clutter will be removed. However, an excessive STC will blank out potential returns close to the transmitter. filter these returns out of the display. Only pulses that rise and fall quickly will be displayed. In technical terms, FTC is a differentiator, meaning it determines the rate of change in the signal, which it then uses to discriminate pulses which are not changing rapidly. 4. Synchronizer. The synchronizer coordinates the timing for range determination. It regulates that rate at which pulses are sent (i.e. sets PRF) and resets the timing clock for range determination for each pulse. Signals from the synchronizer are sent simultaneously to the transmitter, which sends a new pulse, and to the display, which resets the return sweep. 5. Duplexer. This is a switch which alternately connects the transmitter or receiver to the antenna. Its purpose is to protect the receiver from the high power output of the transmitter. During the transmission of an outgoing pulse, the duplexer will be aligned to the transmitter for the duration of the pulse, PW. After the pulse has been sent, the duplexer will align the antenna to the receiver. When the next pulse is sent, the duplexer will shift back to the transmitter. A duplexer is not required if the transmitted power is low. 6. Antenna. The antenna takes the radar pulse from the transmitter and puts it into the air. Furthermore, the antenna must focus the energy into a well-defined beam which increases the power and permits a determination of the direction of the target. The antenna must keep track of its own orientation which can be accomplished by a synchro-transmitter. There are also antenna systems which do not physically move but are steered electronically (in these cases, the orientation of the radar beam is already known a priori). L is the dimension of the antenna, in the direction of interest (i.e. width or height). In the discussion of communications antennas, it was stated that the beam-width for an antenna could be found using q = 2l/L. So it appears that radar antennas have one-half of the beam-width as communications antennas. The difference is that radar antennas are used both to transmit and receive the signal. The interference effects from each direction combine, which has the effect of reducing the beam-width. Therefore when describing two-way systems (like radar) it is appropriate to reduce the beam-width by a factor of ½ in the beam width approximation formula. since there are 4p steradians corresponding to all directions (solid angle, measured in steradians, is defined to be the area of the beam front divided by the range squared, therefore a non-directional beam would cover an area of 4pR2 at distance R, therefore 4p steradians). Example: find the horizontal and vertical beam-width of the AN/SPS-49 long range radar system, and the directional gain in dB. The antenna is 7.3 m wide by 4.3 m tall, and operates at 900 MHz. The wavelength, l=c/f = 0.33 m.
Gdir = 4p/(0.045 0.076) = 3638. 7. Display. The display unit may take a variety of forms but in general is designed to present the received information to an operator. The most basic display type is called an A-scan (amplitude vs. Time delay). The vertical axis is the strength of the return and the horizontal axis is the time delay, or range. The A-scan provides no information about the direction of the target. All of the parameters of the basic pulsed radar system will affect the performance in some way. Here we find specific examples and quantify this dependence where possible. The duration of the pulse and the length of the target along the radial direction determine the duration of the returned pulse. In most cases the length of the return is usually very similar to the transmitted pulse. In the display unit, the pulse (in time) will be converted into a pulse in distance. The range of values from the leading edge to the trailing edge will create some uncertainty in the range to the target. Taken at face value, the ability to accurately measure range is determined by the pulse width. The minimum range effect can be seen on a PPI display as a saturated or blank area around the origin. Increasing the pulse width while maintaining the other parameters the same will also affect the duty cycle and therefore the average power. For many systems, it is desirable to keep the average power fixed. Then the PRF must be simultaneously changed with PW in order to keep the product PW x PRF the same. For example, if the pulse width is reduced by a factor of ½ in order to improve the resolution, then the PRF is usually doubled. The frequency of pulse transmission affects the maximum range that can be displayed. Recall that the synchronizer resets the timing clock as each new pulse is transmitted. Returns from distant targets that do no reach the receiver until after the next pulse has been sent will not be displayed correctly. Since the timing clock has been reset, they will be displayed as if the range where less than actual. If this were possible, then the range information would be considered ambiguous. An operator would not know whether the range were the actual range or some greater value. maintain a low false detection rate, the number of pulses transmitted in each direction should be kept high, usually above ten. So it is easy to see that high pulse repetition rates require smaller dwell times. For a continuous circular scan, for example, the dwell time is related to the rotation rate and the beam-width. losses and are not suitable for long range systems. The frequency will also affect the beam-width. For the same antenna size, a low frequency radar will have a larger beam-width than a high frequency one. In order to keep the beam-width constant, a low frequency radar will need a large antenna. cross-sectional area as seen by the transmitter. In practice, some energy is absorbed and the reflected energy is not distributed equally in all directions. Therefore, the radar cross-section is quite difficult to estimate and is normally determined by measurement. The radar energy spreads out uniformly in all directions. The power per unit area must therefore decrease as the area increases. Since the energy is spread out over the surface of a sphere the factor of 1/4pR2 accounts for the reduction. 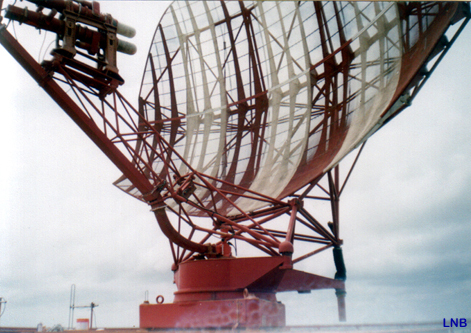 The radar energy is collected by the surface of the target and reflected. The radar cross section s accounts for both of these processes. The reflected energy spreads out just like the transmitted energy. Perhaps the most important feature of this equation is the fourth-root dependence. The practical implication of this is that one must greatly increase the output power to get a modest increase in performance. For example, in order to double the range, the transmitted power would have to be increased 16 times. You should also note that the minimum power level for detection, Smin, depends on the noise level. In practice, this quantity constantly be varied in order to achieve the perfect balance between high sensitivity which is susceptible to noise and low sensitivity which may limit the radar's ability to detect targets.